I know the Eiffel Tower is big, but here it's just ubiquitous, and I mean that fairly literally. Nearly every place we go in Europe, we can see it looming over the local sights. Even from the Grand Place, for example, the famous market square in Brussels, it's there in the distance. I suppose it would be more accurate to say that every place we go in mini-Europe, we can see the Eiffel Tower looming. If I were mini-Emperor and could distill Europe down to one single park, this isn't exactly what I'd come up with, but I applaud the effort. Mini-Europe, just outside of Brussels, takes representative buildings, towns, or monuments from around Europe to introduce each E.U. country, in miniature form. The mini-version of the famous, local Grand Place took 19,000 hours and around 350,000€ to build. The Eiffel Tower is even visible over there in England, just behind Big Ben. We're visiting mini-Europe because it's only a few euros, tacked on to the price of Océade, the biggest water park in Belgium, and our entertainment for the afternoon. We opt out of Atomium, the structure that the Belgians compare to the Eiffel Tower. It is an oddly-shaped metal structure built for a World Expo with the intention of being temporary that became popular enough to keep it up permanently. So, in that sense, it's kind of like the Eiffel Tower. But, frankly, in no other sense is it like the Eiffel Tower at all. Besides the Eiffel Tower, mini-Europe's choices to represent France are both obvious and not-so-obvious. There's the Arc de Triomphe, and Sacré Coeur, for Paris. And the Loire Valley château of Chenonceau. There's also a tiny modern chapel of Ronchamp, a vineyard castle Clos Vougeot, the Thalys train that links Paris and Brussels, the Marseilles port, the former Royal Salt Works of Arc-et-Senans, a deregulated European airport (highlighting many French-made Airbus planes), and the Pompidou. I understand the Pompidou is famous, and was architecturally controversial (and, therefore, significant), but it's just so darn ugly. Even in miniature. But I don't think the omission of Notre Dame is nearly as bad as the omission of the entire Vatican. Given that the park emphasizes the importance of Europe's Christian heritage -- plenty of churches and chapels -- we can't believe that St. Peter's Basilica in the Vatican isn't there. Or at least a mini-Pope, on his mini-balcony, giving out mini-blessings. And while Italy is covered, with the leaning Tower of Pisa, and Venice, along with the Palazzo Publico in Siena, Mount Vesuvius, the small southern town of Alberobello, and the Villa Rotonda in Vicenza, our family is completely baffled that they don't include Florence or Rome. Anything from Rome, the heart of the Roman Empire that once covered much of Europe. What, no Coliseum? Really?! and St. Mark's Church in Zagreb, for example. Also enjoyable are some of the tidbits gleaned from the guide booklet. This is where Anthony learns the fact he gleefully likes to repeat -- that " at 1573 working hours per annum in 2012, the French are the least industrious people in Europe." We know Belgium is industrious, because they spent 19,000 hours (that's about 12 average French work-years) just on the oxymoronic mini-Grand Place alone. We also learn that France is the EU's largest country by surface area, but not by population. Correspondingly, it's one of the biggest sections in mini-Europe, well-represented (by everything but Notre Dame, that is). This, along with some history of conquest, collaboration, and condescension probably helps explain, in part, why the rest of Europe either seems at a constant low-level of anti-French, or at least likes to pretend it. Even in this year's Eurovision contest, France only moved up from last place in 2014 to almost-last-place in 2015. It may be that the songs they enter are crap, but if you had seen the British entry this year, that beat out France by one place, you'd know there must be some partisan voting. France's crap entry was a world better than England's crap entry. At mini-Europe there is, even, mini-cheese, but I am mini-disappointed to tell you it's not in mini-France, but rather in mini-Netherlands, in the mini-town of Alkmaar, which is probably fairly mini even at full scale. Since 1983, this building has housed the Dutch Cheese Museum, and there's a traditional cheese market held in the Waagplein (the place in front) since the 19th century. Well, I guess I know someplace I'll be visiting in the Netherlands. This little Burgundy cheese is called, quite simply, a Little Burgundian -- Le Petit Bourguignon. 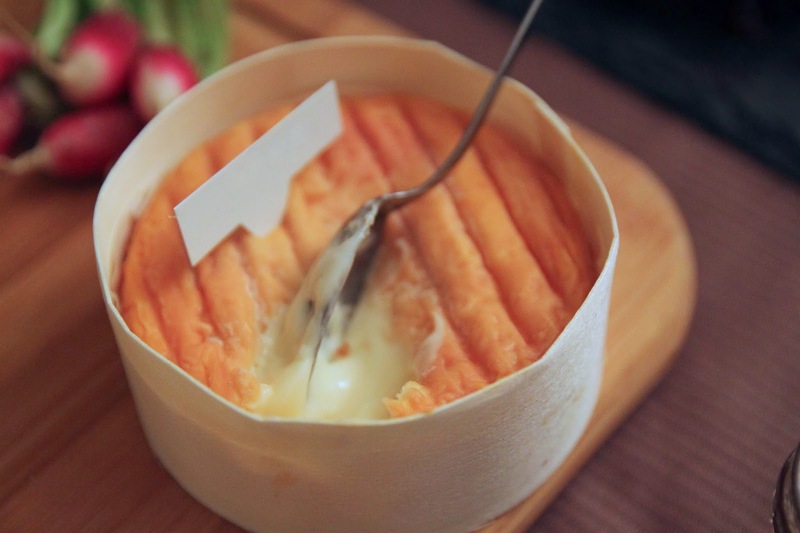 It makes sense, since it's a few-bite-sized version of the Burgundy classic, Epoisse. 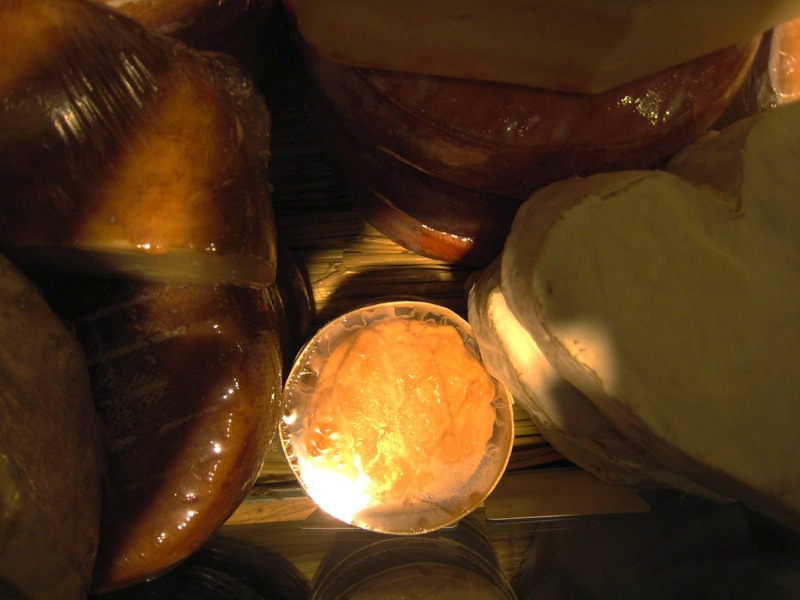 It's a raw cows' milk cheese covered with sticky orange mold, and all in all is both so liquid and so pungent, it has to be sold in a paper container, inside a wooden container, wrapped up in plastic wrap. At room temperature -- really the only way to eat this cheese -- it's a goopy mess, best dished out with a spoon. It's also got quite a tang to the cheese, and a sweaty toe-jam smell to the rind. Petit Bourguignon is something like a mini-Epoisse, a mini-Chambertin, a mini-Langres (which is, in and of itself, sort of a mini-Epoisse). It's a great thing, a grand thing, made miniature, just like some of the highlights of Europe presented to us on a 1/25th (or such) scale at Mini-Europe. Quality-wise, Petit Bourguignon is on par with Sacré Coeur and the Eiffel Tower, not the atrocious Centre Pompidou. The Pompidon is awesome architecture and i think it is really well integrated in the center of paris. Such a modern building in the middle of that old neighbourhood. Frankly, it makes me happy that somebody likes it! I just can't bring myself to like it even the tiniest bit, but I do realize it's very subjective. It probably doesn't help my opinion that I was pickpocketed right outside it (grrrr....). I will admit that I like the modern-art fountains right outside it.